It’s State of the TBR time and I think I’ve done rather well! Sorry it’s a bit fuzzy, but you can hopefully see that the one with the half-pink spine (Thirkell, yay!) is the end of the front row and you can’t help but notice that the Pile has room to return to the TBR shelf (it was like this in June). I finished 12 books in June and half of them were from the actual TBR (the others were Kindle books or review books and my Iris Murdoch. I’ve not yet posted about “Sacred Britannia” but will let you know when the review comes out on Shiny New Books. 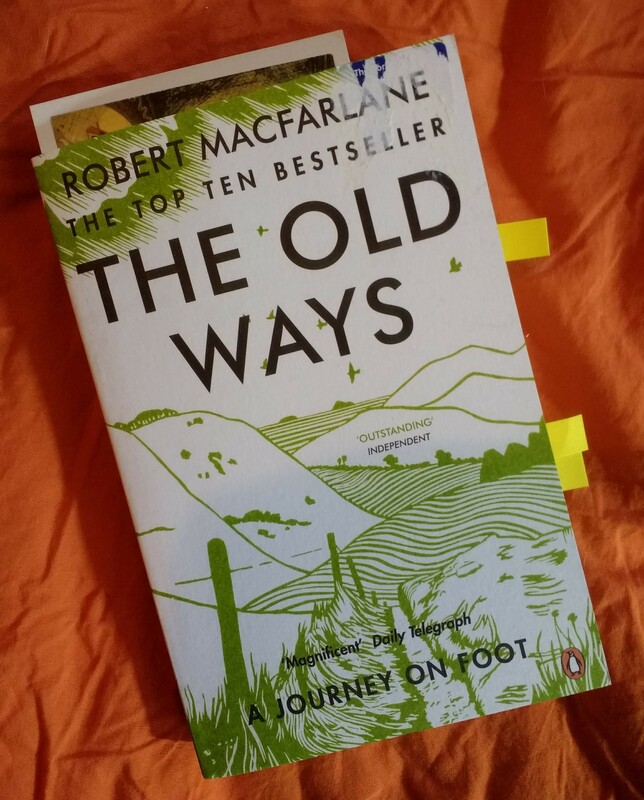 I’m currently reading Robert McFarllane’s “The Old Ways” (I was going to post a prettier, artier photo, but I quite like this in-progress one) and really, really enjoying it – I was enthusing about it yesterday and I’m still really liking it, so even though it’s quite substantial, I don’t think it will take that long to read. I am only up to Book 6 (this one) in my 20BooksofSummer project but am hoping I will have more time for the project this month, and also quite a lot of the books coming up are fiction or running books, which are fairly brisk reads. I also have a week off coming up (we’re not going anywhere, maybe some day-trips, but I needed a break from work) so that should help. 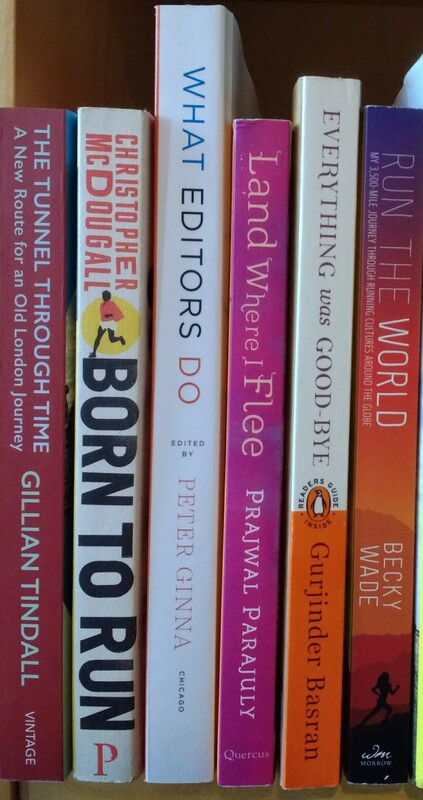 Talking of the books that are coming up, here’s the front end of the TBR, and all of these are books for 20BooksofSummer (I’ve added “Everything Was Good-Bye” to replace “The Accidental Apprentice” which was pretty well a Did Not Start. Also coming up this month I have Iris Murdoch’s only historical novel, “The Red and the Green”, set during Ireland’s Easter Rising (and not one of her most major novels, but still of interest: preview post here) for my IMreadalong project, and Claudia Gold’s “King of the North Wind” about Henry II to review for Shiny and Helen Cullen’s “The Lost Letters of William Woolf” to read for NetGalley (I have other NetGalley books but no others published in July). I’ll also be reading Amby Burfoot’s “Run Forever” which is Book of the Month in the Runners’ Bookshelf Facebook group I belong to. What does your July of reading look like? So glad you are enjoying The Old Ways, was it you who bought me my hardback edition a couple of years ago? Good reading there, I did 11 and my June in review post comes out a bit later. Oh, I think it might have been, although I think I’ve bought it for Meg, too. Or that might have been the Simon Armitage walking book. But yes, it’s great. I have seen your June post but am WAY behind in reading blog posts – no time for it around the athletics all weekend then then the wrestling to sort out my photos on my post yesterday! (which are still not right). I love your organization of planned reading. I’m very much a squirrel and find it hard to know what will capture my fancy. Only way around that is hard copy with me and no kindle. I like taking away the need for choices by just reading in order or for reviews / challenges! Hooray, an obscure, fat, lost Russian classic is right down your street! That does sound like a good reading month! It looks as though you have some interesting books coming up this month. You’re doing much better with the 20 Books of Summer than I am! I have only read three so far – and of those, I’ve only reviewed one. I’m hoping to make more progress in July. That’s a relief to know – I was a bit horrified and I did NO reading over the weekend, when I thought I’d do a fair bit! Good luck with your 20Books through July. Oh wow, that’s a coup (I think my “best” one is Alistair Campbell). Yes, I really enjoyed it, in fact I’m sitting down to review it right now! #20Books is fun for the connections but I made it hard for myself this summer and I’m not doing terribly well. I’m enjoying my reading, though, which is the main thing! Exactly. I’m going to seek out his other ones for sure.